Is this the BlackBerry Slider? Storm 3? | BlackBerry Blast! BlackBerry Blast! > News > Is this the BlackBerry Slider? Storm 3? Is this the BlackBerry Slider? Storm 3? We recently heard a rumor that RIM was working on a Pre-like BlackBerry slider. Actually, rumors of a slider from RIM have been floating around for quite awhile. Now we see an actual picture of what is believed to be the slider. 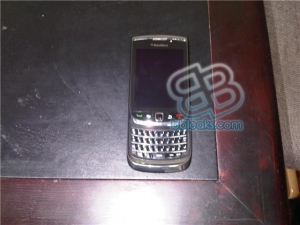 Could it be the BlackBerry Storm 3? BBLeaks got its hands on this photo and they're not reporting they have other photos and video. CrackBerry is also reporting that the slider is definitely a reality and this is it. Most people haven't been impressed with these photos and that's understandable. It doesn't look as slick as other BlackBerrys, however the keyboard looks pretty good. Stay tuned. More photos and videos are likely on the way. Is RIM planning to release a BlackBerry slider?